This guide will help you to choose the subwoofer that best suits your needs. It's important to us that you are more than happy with your purchase, and this is why we've prepared this guide. how are thermal and mechanical memory effects reduced? how is the re-radiation of bass inside the box minimized? is a defeatable rumble filter provided to protect the driver from bottoming? is it an open or closed loop system? If these terms sounds like incomprehensible jargon, you may wish to read more in our technology section. When you understand their meaning, and we try to explain them clearly, you will wonder as we do why anyone would want to build a subwoofer any other way. 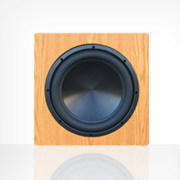 Many customers will be happy to choose from our excellent value pre-built subwoofers. We also provide a custom option with our Custom Installation range. The choice between the two is an individual choice, and will depend on your own preferences and goals. 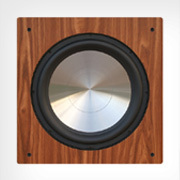 Those who don't have the means to build their own enclosure may prefer to select their own furniture maker to build a subwoofer which is custom-matched to their room. Architectural solutions - Built-in subwoofers are possible, either to hide them within the room, or display them as a feature. This also allows an otherwise large and obtrusive array of subwoofers to be creatively integrated into the room. This option can dedicated rooms where "showing off" the equipment may be desired, or regular living rooms where a non-technical hidden away solution is preferred. Infinite baffle - This is one specific application of an architectural solution where the box is replaced with a large air space such as an attic or basement. One of our GR products is designed for this application. Dipole subwoofers - A popular choice among DIY enthusiasts where drivers operate into free air, completely eliminating box effects. Open baffle dipoles also interact with a room differently. Custom enclosure designs - A unique one-of-a-kind subwoofer is possible. We have many examples in our review section. You can also supply your furniture maker with our dimensioned plans. Do-it-yourself (DIY) - There is a large online community of DIY enthusiasts who prefer to build their own enclosures. Some do it to save money, others to get more for their money, and most also do it for the satisfaction of producing their own. Which pre-built subwoofer is best for me? For moderate output or for small to medium sized rooms, choose between our 12" products (F12, F12G and F12SE). The main performance difference is in the drivers. F12G uses a paper driver designed by GR Research. The paper driver is lighter than our standard aluminum drivers and has a more extended response. It can handle a higher crossover point, however, this is only significant when crossing above 80 Hz If a higher crossover point is desired, F12G is the subwoofer of choice. Please note: when crossing this high, localization can become an issue and dual subwoofers are recommended. Regarding the lower mass, this results in slightly better dynamics at low to moderate output levels. The downside with the paper cone is that it is not as stiff as our aluminum drivers. Our standard F12 subwoofer features the same driver and amplifier as our signature edition, but has a vinyl veneer. Where more output is desired, we recommend either multiple subwoofers or our 15" range (F15, D15SE). The main difference between our 12" and 15" subwoofers are size and output. Both have the same amount of power. 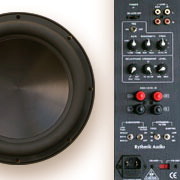 Due to the larger radiating area of the 15" driver, 3 dB more output on continuous signals can be achieved. Dynamic output for short bursts can be as much as 5 dB greater. For bass frequencies, a difference of 5 dB will sound almost twice as loud*. Multiple 12" subwoofers may also be preferred for their room integration. Not only are they smaller and fit more easily into available space, multiple subwoofers can also be placed to better optimize interaction with room standing waves. Some in fact use 3 or more subwoofers for this purpose. Do 12" drivers sound faster than 15" drivers? Prior to the release of our finished subwoofers, we found our 12" products had a slight sound quality edge on the 15" subwoofers. However, better 15" drivers have bridged the gap. As a result, sound quality is no longer a reason to choose a smaller sub. We recommend that customers base their choice on other factors. Music and home theatre subwoofers typically have different requirements. In general, home theatre demands high output at low frequencies. The ability of the subwoofer to handle dynamic bursts of low frequency output will typically be the limiting factor in output. 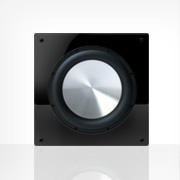 Customers looking for particularly high output for home theatre should consider multiple subwoofers and/or our 15" range. Music also benefits from deep bass, but not normally at high output levels. Typically the output of a subwoofer for music will be limited by the thermal capacity of the driver and the amplifier power. Since music places a less intermittent demand on the subwoofer, amplifier power is more significant. For home theatre, F15 will generally sound almost twice as loud as F12. For music, the output increase will not be less. 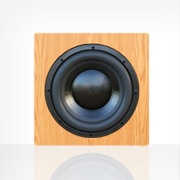 Driving a single subwoofer hard with music for extended periods can result in the amplifier over heating. If this occurs, thermal protection circuits will automatically shut down the amplifier until it cools down and is safe to use again. If this happens, it is an indication that more subwoofers are required to sustain the desired output level. If you want something that is not available in pre-built form, our Custom Install range is for you. Not only can you achieve a unique design, any type of subwoofer alignment is possible. If you want a custom alignment, please let us know before ordering, since the amplifier must be modified before it is shipped. Direct Servo can be applied to any type of subwoofer, including sealed, vented, passive radiator, band pass, horn, transmission line, open baffle, infinite baffle or isobaric. Contact us to discuss your project. Our comments above on 12" vs 15" products as well as paper vs aluminum based products apply also to our CI range. Our CI range also includes a dual driver version of our GR 12" paper driver product. 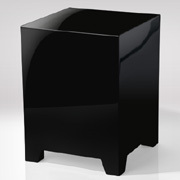 We also have an open baffle/infinite baffle product which is not available in our pre-built subwoofer range. Creating a realistic sound stage is an important aspect of high end audio reproduction. When everything is set up correctly, an appropriate reference sound track can be used to test the depth, width and height of the sound stage. This can be done before and after adding the subwoofer to identity where the potential problem is. Our recommendation is the Chesky "Best of Chesky jazz and more audiophile test: volume 2". 1) Track 3: this is a recording with a minimal filtering. Natural recordings can inadvertently pick up unwanted infrasonic frequencies. The standard practice has been to filter those with a rumble filter. Some audiophile recording labels avoid doing that and claim such process can degrade sound quality. You should observe some subsonic cone movement and compare the sound to other tracks to see if the presence of the recording is enhanced. 2) Tracks 14-31: These tracks compare the same drum in a dry dead studio (almost completely absorb the reflection from the studio walls) and a live studio. One can try to turn on and off the subwoofer to see how much the sense of depth and room reverberance is enhanced by the subwoofer. 3) Track 45-46: Height of sound stage. This is one of the most difficult tests. Only a few speakers with good room setup can achieve good height in sound stage. 4) Track 47: Spatial clues. Four musicians with 4 different instruments parade around the microphone. For a reasonably good system, you can hear the musicians circling around your front speakers. This is done with a 2 channel recording! 5) Track 51-59: Live recording of sound effects. Test of see if your sound system can put you in these actual live events. *Please note: While 10 dB for midrange frequencies is considered a perceived doubling, for bass frequencies it is closer to 6 dB, as seen in equal loudness contours.